Before I get into the insanely festive Christmas tutorials that I have planned, I thought I would ease into it with something simple and very sparkly. 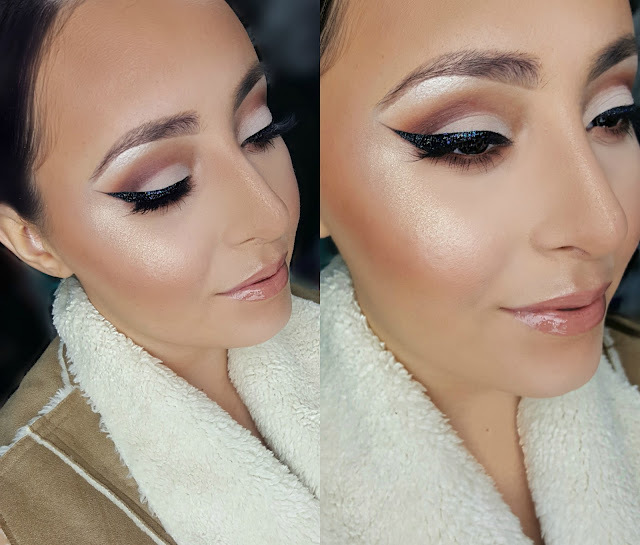 This look is for the girl who wants to do something special, but isn't necessarily feeling all of the typical Christmas-y makeup. Or this could be for you if you procrastinated a little too long before getting ready for that office holiday party. 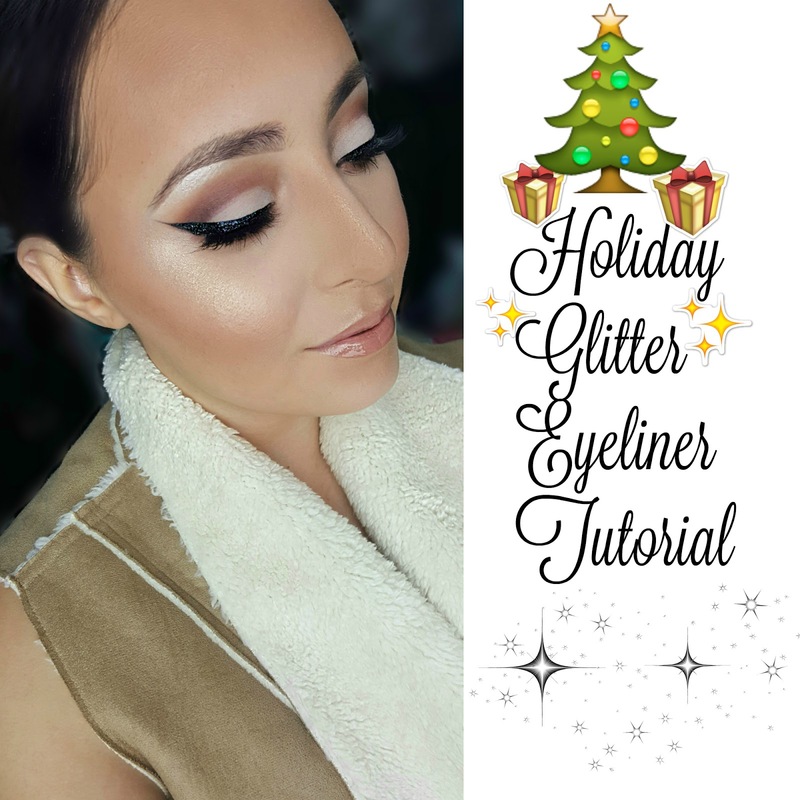 Regardless of why you plan on using it, the touch of glitter sure does add some pizzazz to your typical everyday eyeliner. It dresses up your eyes just enough without making you look like you did entirely too much. But if you really feel like kicking it up a notch, use red or green glitter instead--you'll definitely be channeling the Christmas spirit! 1♥ If you want to wear the eyeliner on it's own, you can skip on to the next section. Today, I felt like pairing it with some eyeshadow. As usual, I started off with a bare, primed eyelid. I had used the Lorac Behind The Scenes Eye Primer. Then, I moved on to laying down my transition shade. With a very large fluffy brush, I swiped Honey Butter (very light peachy tan) from the Too Faced Natural Matte Palette through my brow bone and crease area from my outer corner all the way to my inner corner. 2♥ Using a slightly smaller blending brush, I defined my outer corner and outer third of my crease with Chocolate Cookie (warm medium brown) from the same TF Palette while still blending it upwards into Honey Butter. 3♥ To define and deepen that outer corner even more, I placed Burgundy from the Lorac Pro Matte Palette directly into the crease using a pencil brush. Once the desired pigmentation was achieved, I used the same blending brush from the last step to make sure there were no harsh lines between the shades. 4♥ I wanted a relatively clean, bare lid so that the eyeliner that I put on later would "pop" against it, so I cleaned up the area with a flat synthetic brush and Mac Paint Pot in Soft Ochre. To set that, I applied a mixture of Bare and Linen from the Lorac Pro Matte Palette using the same flat synthetic brush. 5♥ Now on to the really fun stuff! To start, you'll need to create your typical winged eyeliner. Create it as thin or thick and as long or short as you want it--whatever style you are comfortable with. I did my wing pretty thin today surprisingly. And as always I used my trusty Stila Stay All Day Waterproof Liquid Eye Liner in Black. 6♥ Here's how I applied the glitter: Since you definitely don't want black glitter migrating all over your face throughout the day, I suggest you use an adhesive of some sort for it to stick to. I applied a very thin layer of the LA Splash Sealer Base directly on top of my dried eyeliner using a small detailer brush. Using that same brush, I applied small amounts at a time of the Coastal Scents Glitter in Black Out on top of the adhesive. I worked with small amounts of glitter each time because that allowed me to minimize fall out and also to control the opacity of the sparkliness if that makes sense. 7♥ If you find that the black glitter still reads a little too "flat" like I did, you can take another glitter or even a glitter liner in a brighter shade and add accents throughout your winged eyeliner. I used the NYX Liquid Crystal Liner in Crystal Hip and dotted it throughout, which gave my winged eyeliner a cool blue, purple, and green tinge that made the black glitter stand out more. 8♥ Then, just do your finishing touches like brows and lashes. I used the House of Lashes in Boudoir and I also added Honey Butter, Chocolate Cookie, and Burgundy to the lower lash line just for the sake of it not looking too bare.